 Champions League Final tickets up for grabs! Glow is easy to play and before you start playing, you can alter your total wager at the bottom of the slot. Also, as you would expect from a NetEnt slot, it's very easy to do so. The slot also has an autoplay function which is particularly interesting as you then can just watch this beautiful slot play. The background is filled with trees and the Northern lights shine trhough the branches. With this, you can clearly see that Net Entertainment is a Swedish company. The slot also has a wild symbol -a bear- and this symbol will lead to even more and bigger wins. Namely, the wild symbol can substitute for any other symbol and it also functions as a multiplier. What's more, the wild isn't even the only multiplier on this slot. That is, wins formed with animals will also trigger a mutliplier. Glow is a slot developed by Net Entertainment but you won’t find it at every online casino. Namely, it is a video slot released solely for casinos part of the Betsson Group. With this, it is a pretty interesting slot already as you won’t come across it too often. It is a video slot with a Nordic theme. In the background, you will find the Northern lights and you will encounter many animals on your reels. When a win forms with these animals, a feature with a multiplier and free spins gets triggered. This makes this slot very interesting for those who feel like trying their luck. Glow is easy to play and before you start playing, you can alter your total wager at the bottom of the slot. Also, as you would expect from a NetEnt slot, it’s very easy to do so. The slot also has an autoplay function which is particularly interesting as you then can just watch this beautiful slot play. The background is filled with trees and the Northern lights shine through the branches. With this, you can clearly see that Net Entertainment is a Swedish company. The slot also has a wild symbol -a bear- and this symbol will lead to even more and bigger wins. Namely, the wild symbol can substitute for any other symbol and it also functions as a multiplier. What’s more, the wild isn’t even the only multiplier on this slot. That is, wins formed with animals will also trigger a multiplier. 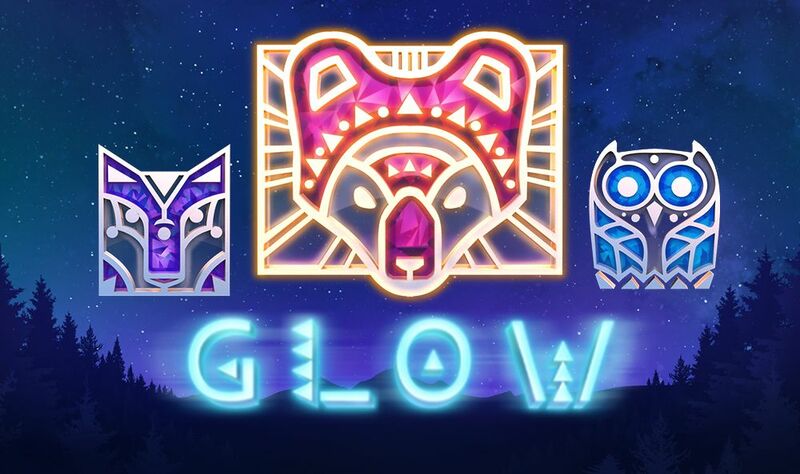 Glow is equipped with free spins and you will win free spins way more frequently than on most other slots. If a win involving standard symbols forms, nothing special happens; you just win. However, when a win involving animals forms, something fun happens. Namely, all wins will be doubled and you’re suddenly playing for free. And this is great, of course, because big wins can keep on coming when you manage to unlock even more free spins by having animal-wins on your reels. The more animals are part of a win, the bigger you win, the more free spins you receive, and the longer the multiplier stays active. If during this multiplier, a win with a wild forms, that win will be multiplied by a total of four! Glow has a total of 15 pay lines and you cannot determine how many of them will be active; all of them will. If you want to play this slot, make sure to go to an online casino that is part of the Betsson Group, since those are the online casinos allowed to offer this game. This definitely is a slot you should try. The background music and sound effects play an important role in the overall experience and it is also very easy to look at. The fact that there will almost always be something going on, makes it a very exciting slot that will never bore you.